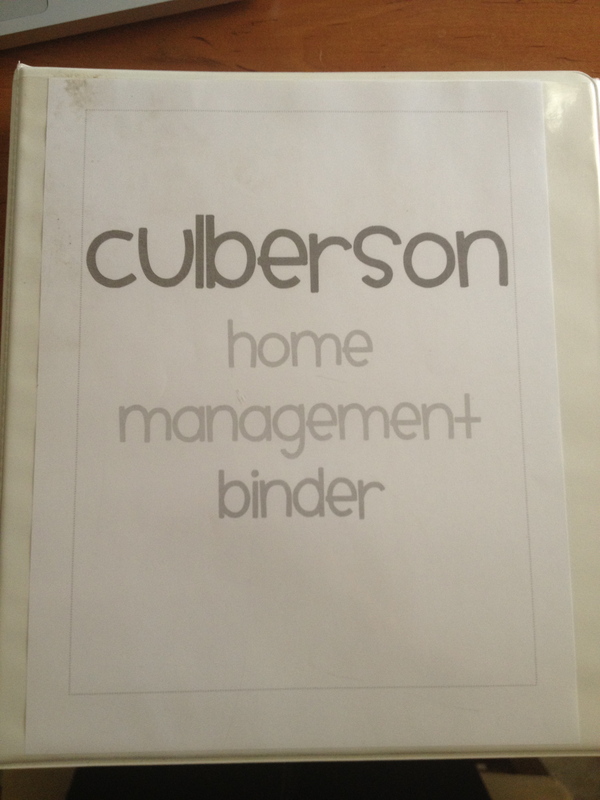 So with the impending deployment, I’ve been inspired to make a home management binder. Complete with calendar, weekly planner, budget, home projects, shopping lists, and a few other things to keep me on track these next 8 months. I made one the last deployment and it worked wonders and through budgeting and organization were able to pay off $13,000 car loan…go us! 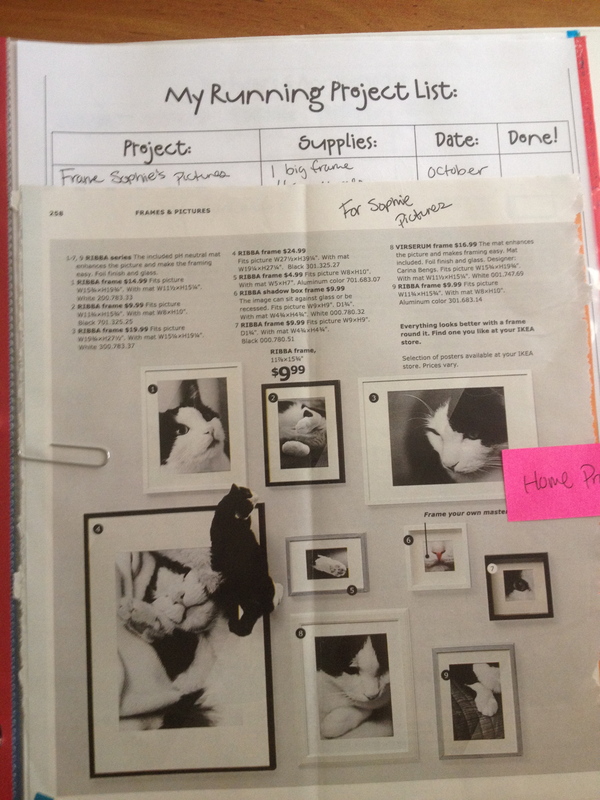 Having a child this go around, a home binder is a MUST! All the responsibility is on me now and having it organized and neatly in front of me will make it that much easier. 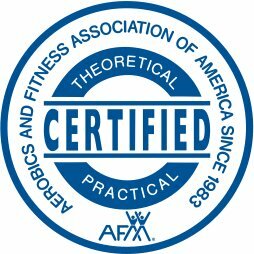 I can’t take all the credit, thanks to a few awesome blogs, I was able to download all the templates I needed for my folder. All credit goes to their hard work! The Nest Effect has some awesome templates. Like the cover above. Download it here. My first page is a monthly calendar. Found here. Next, we have the Weekly Overview and Planner. They are both found in the same template. Prepared Not Scared has TONS more. 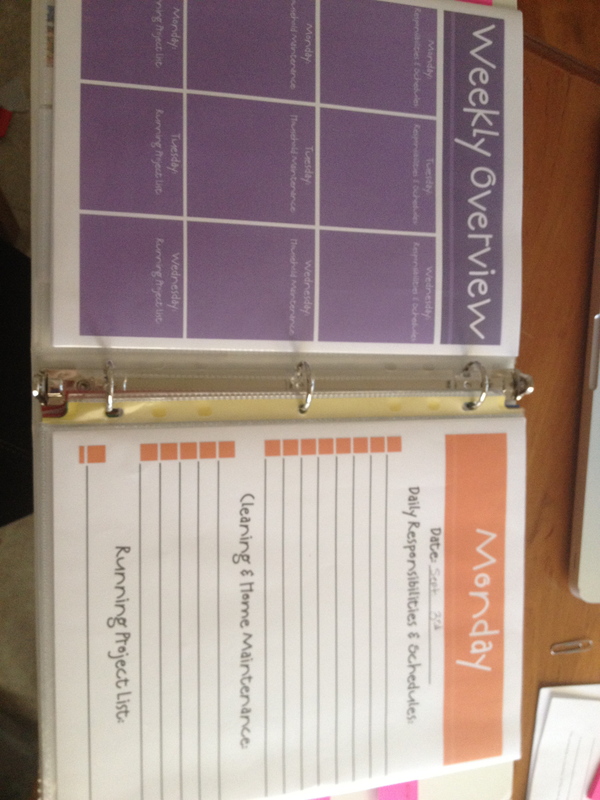 The weekly planner breaks each day down by ‘responsibilities/schedule, household maintenance, and projects’. 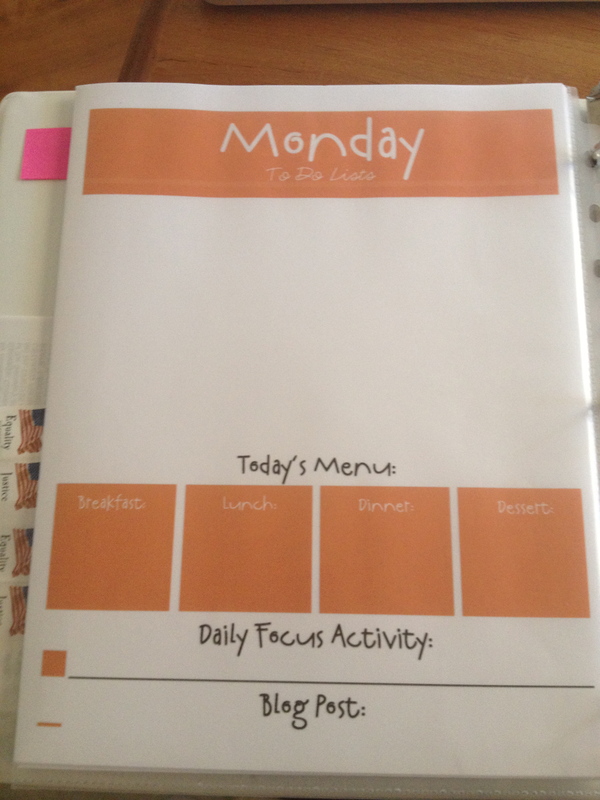 The daily planner is more detailed with the schedule, cleaning, project list, to-do list, menu, etc…totally awesome! Next in the same section is my grocery/shopping list. Found here and here. 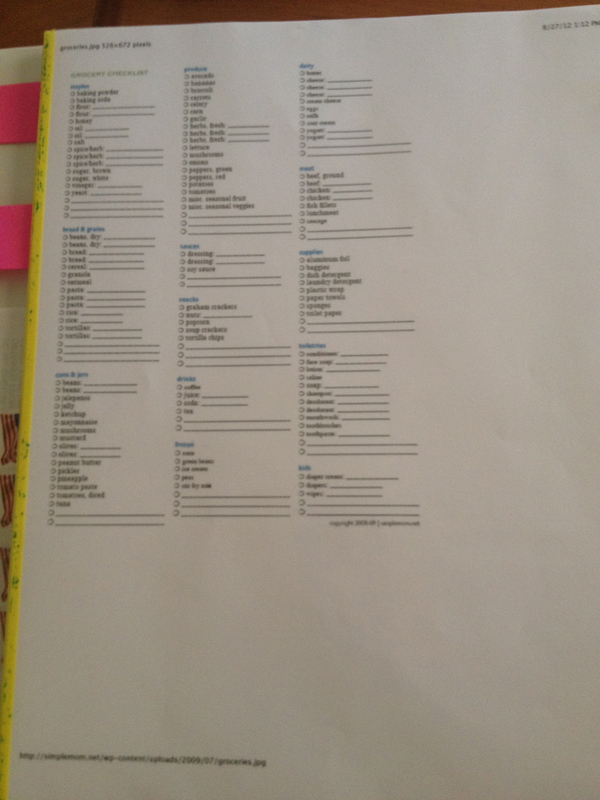 I break my grocery list down to bi-weekly. 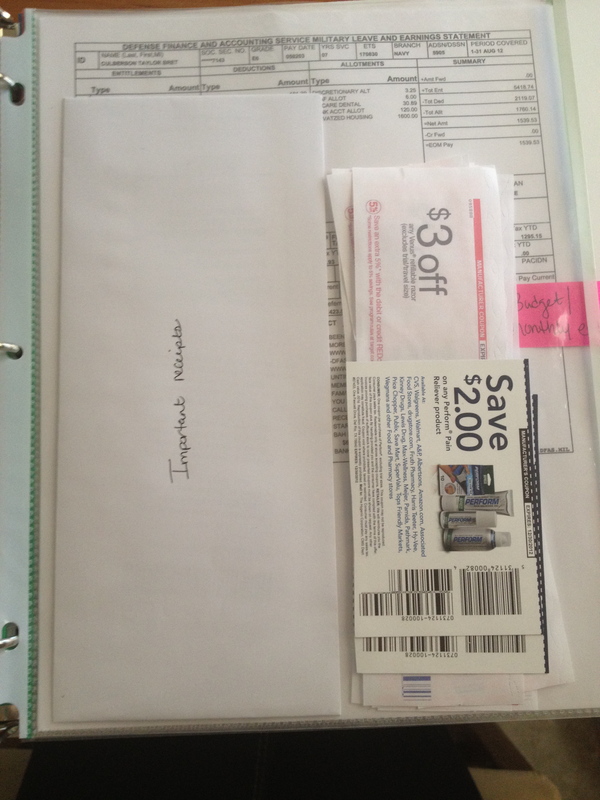 In this section, I also have an ‘important receipts and coupons’ sleeve. On to the budget section. I have about 6 sleeves in this section, it’s very detailed. 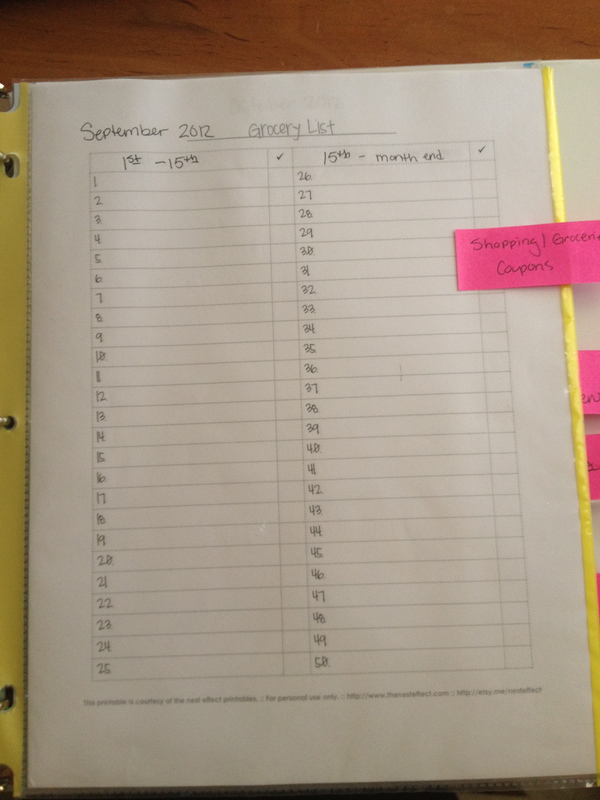 I start out with our pay-stub page. I’m obviously not going to show it here, lots of important info on that stub. 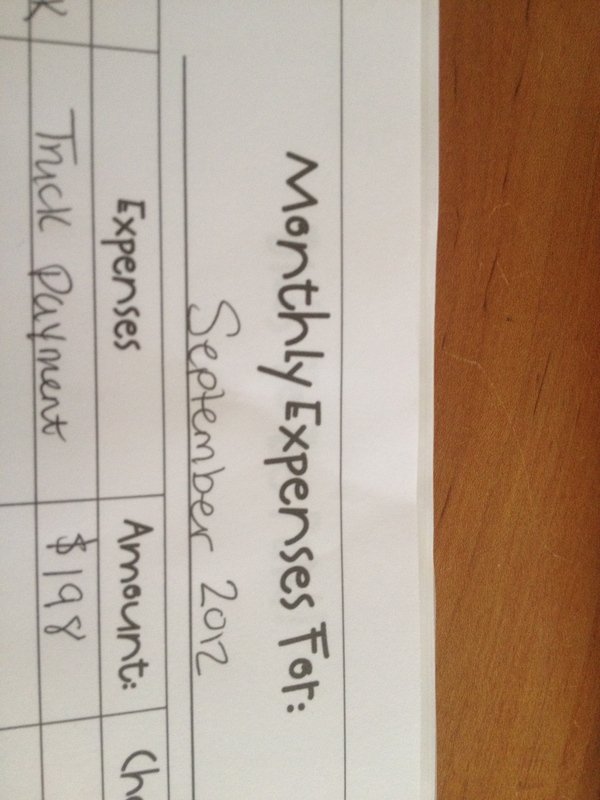 Next is a monthly expense form. Again, I do this bi-weekly as we are paid. 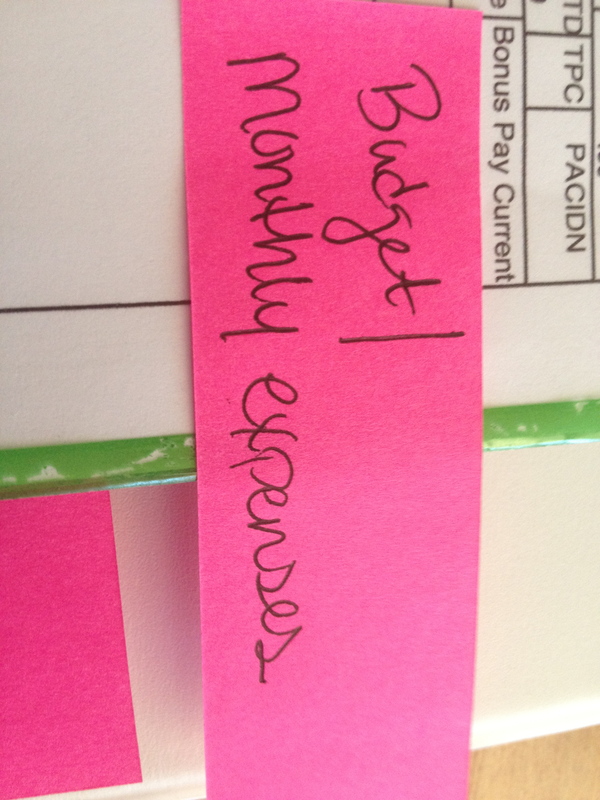 I keep a running log of expenses going out and our balance. Download above form here. It’s page 4 in the downloads. I also use the ‘Loan repayment log’ for our truck and credit card. Found here. It’s never to late to start budgeting for Christmas. 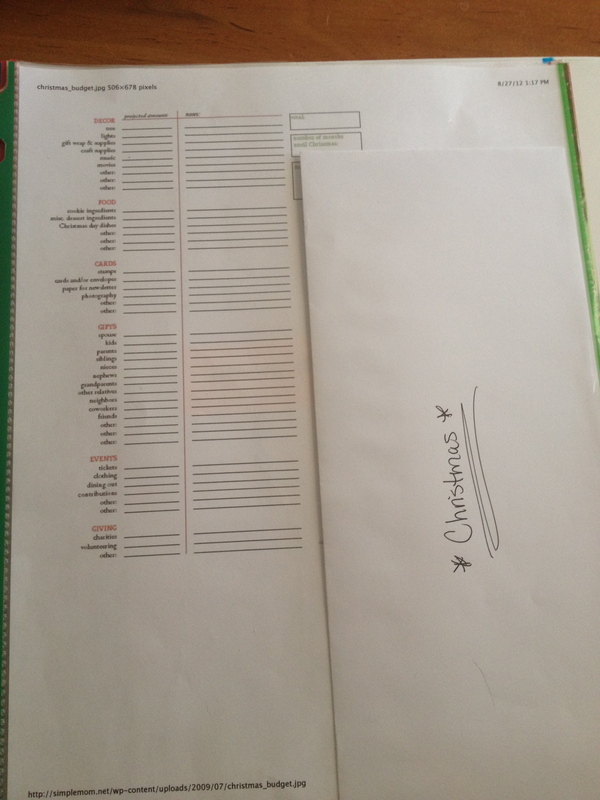 I have a budget list and envelope for cash. Download form. Then I have a sleeve for monthly bills that I receive in the mail, which are very few, thanks to online bill pay. 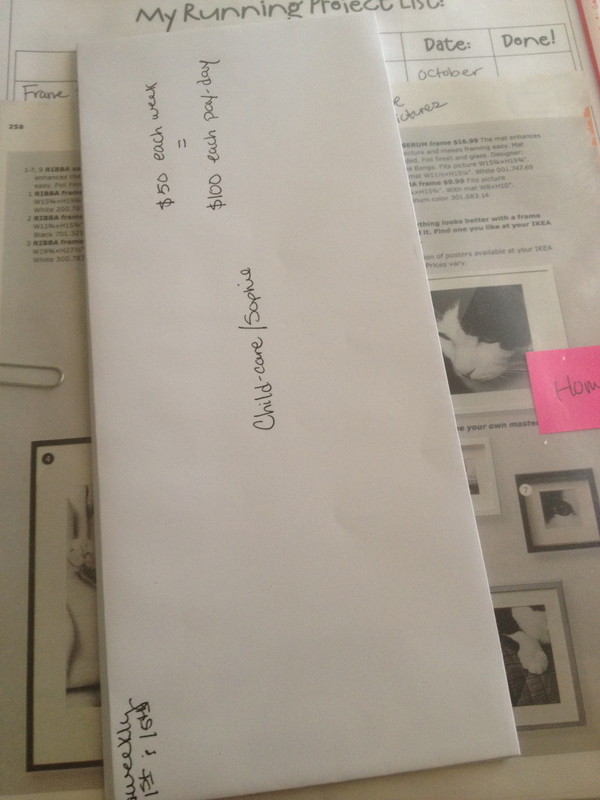 I also have a few cash envelopes (think Dave Ramsey envelope system). Mostly for ‘odd’ bills and monthly needs (clothing, emergency cash, etc). Next section is home projects. Download form. Page 20. I also slide magazine clippings of ideas in here as well. My next section is just Misc. It includes – birthday/anniversary list, family yellow pages, travel packing & check list, and a ‘to mail’ folder. So a rundown of the blogs that inspired me. 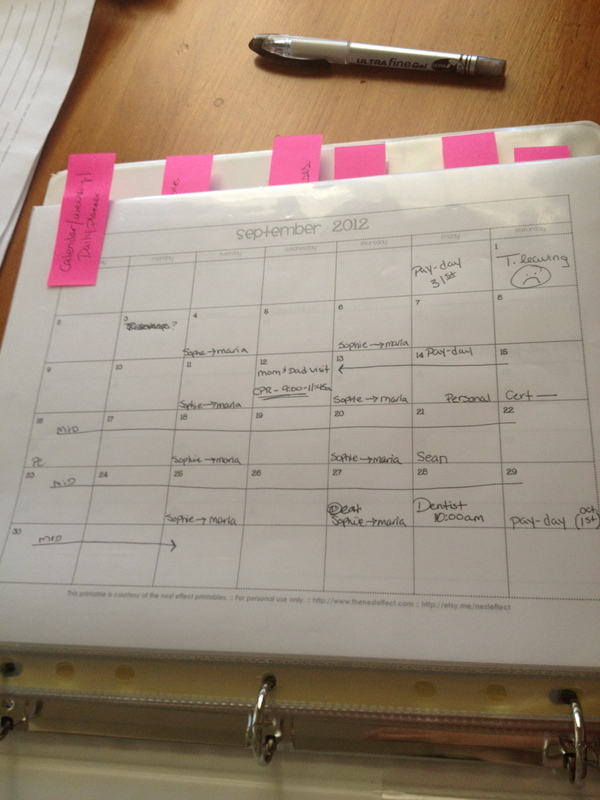 Organized Home – lots of great ideas and printables. 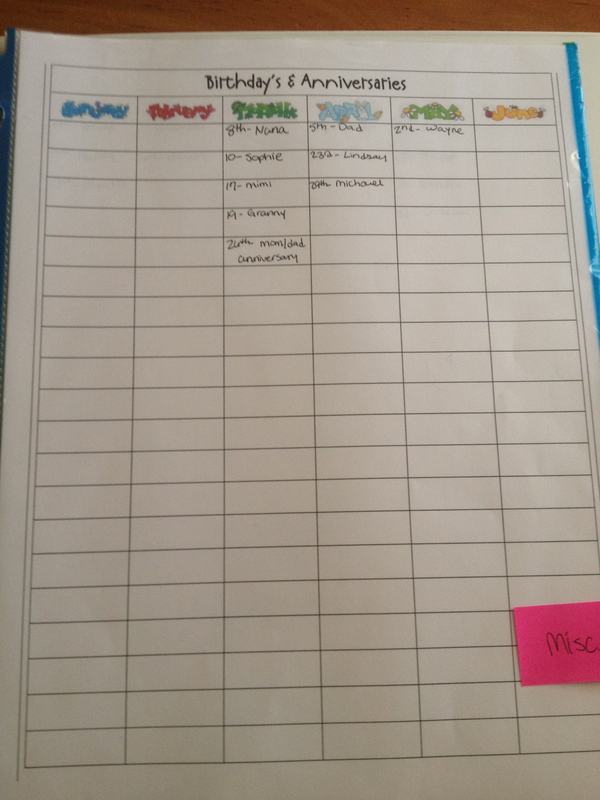 Miss Poppins – Family planner ideas. 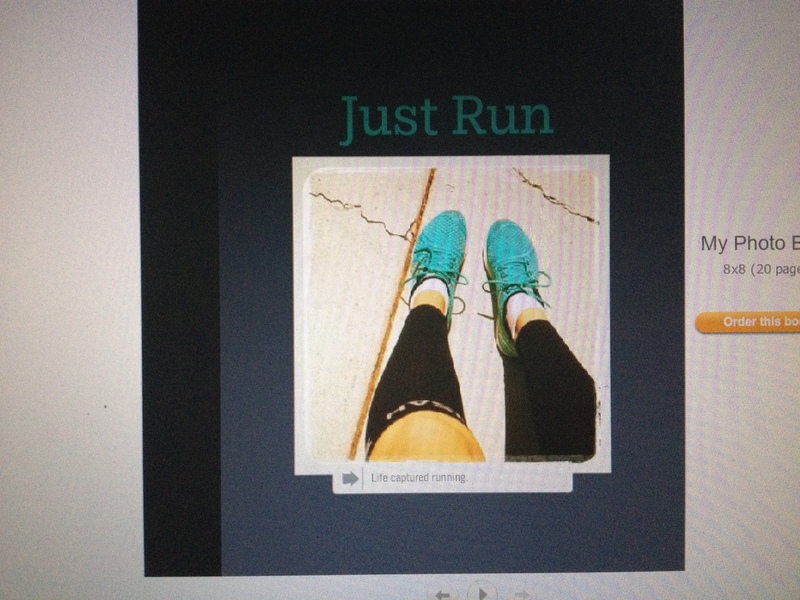 The Nest Effect – awesome printables. 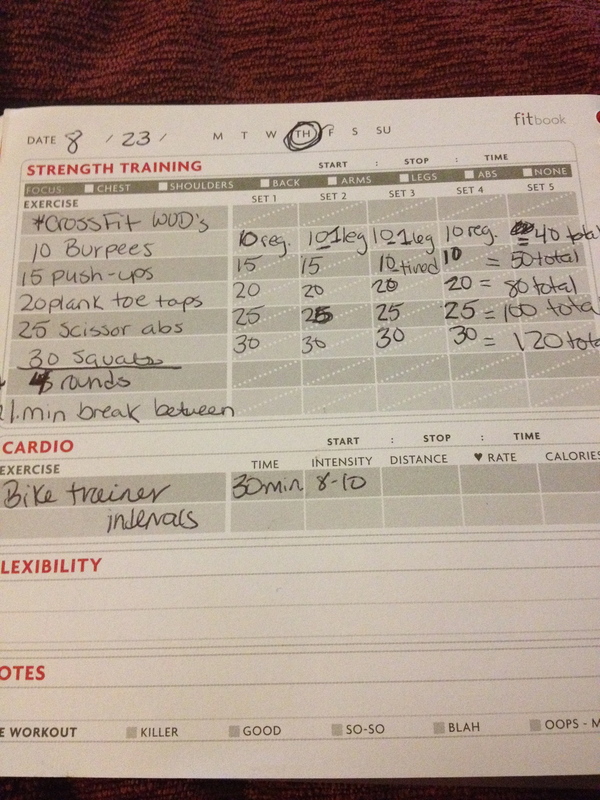 And if you want to see how I keep my workouts and diet organized, check out this post. 10 burpees – 15 pushups – 20 plank toe taps – 25 scissor kicks – 30 squats. I forgot to time it, but I’m guessing roughly 20 minutes with a few rests in between. So that’s 40 burpees, 50 pushups (because I got tired and my form was slipping), 80 plank toe taps, 100 scissor kicks, 120 squats. Then I hopped on my bike trainer for 30 minutes to bust out some intervals. Not going to lie, my legs were super shaky. 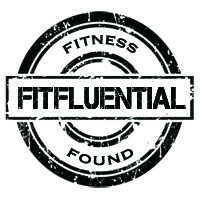 Hope you found time to sweat profusely be active today! 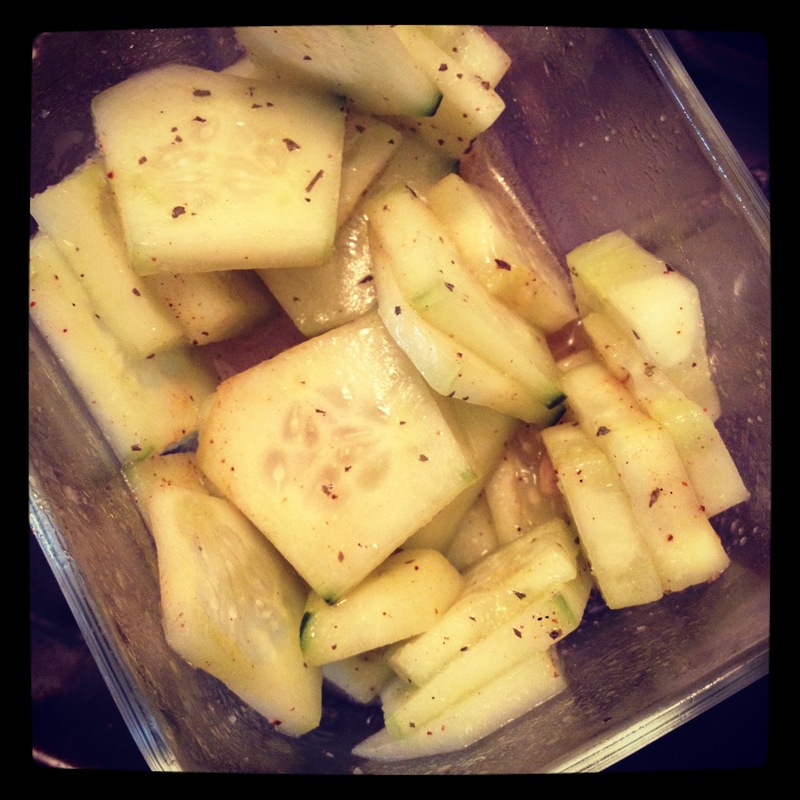 Sometimes finding healthy snacks can be a challenge. 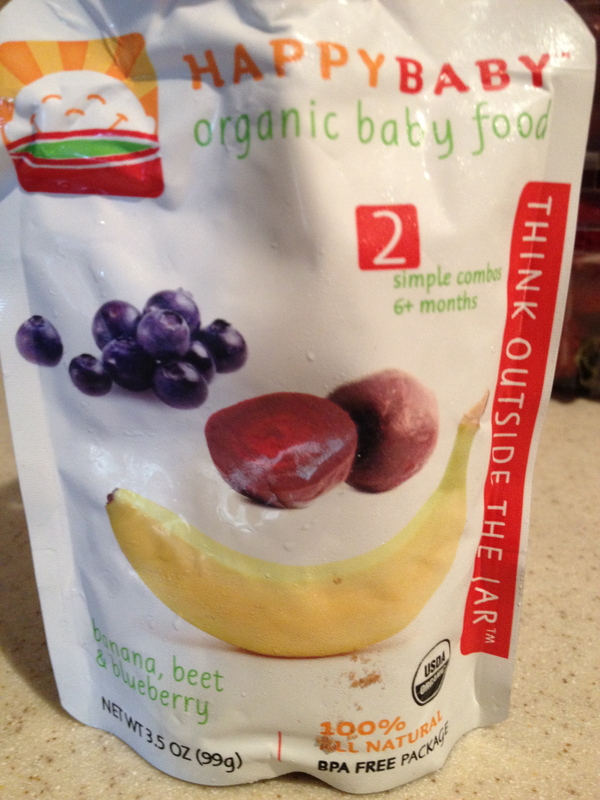 I wanted to share what Sophie enjoys snacking on (which is mostly anything and everything). Picky, she is not! 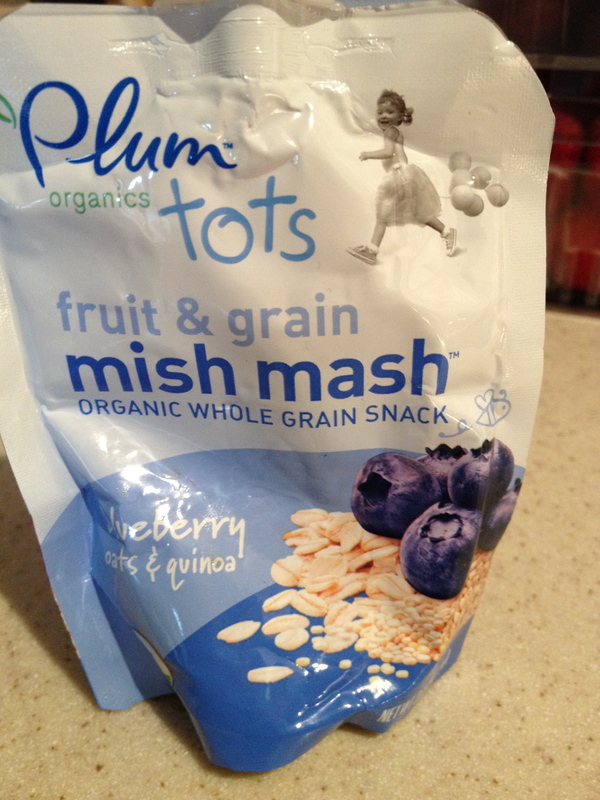 It seems there are better ‘snacky’ selections for adults, but most kids snacks are full of sugar and fake ingredients. 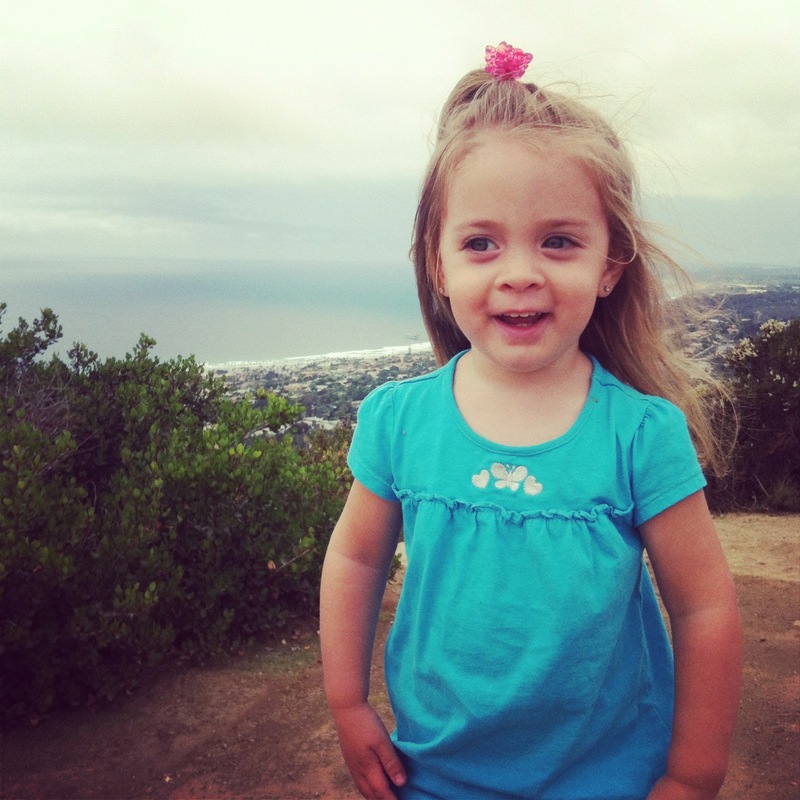 Thankfully, we have a great eater and she is very good about eating fruits/veggies. 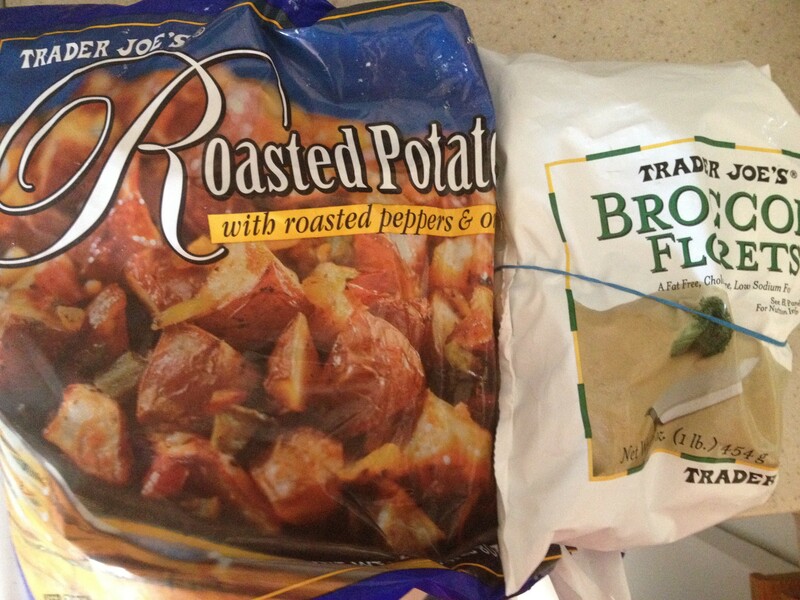 Trader Joe’s is our go-to for all things produce. 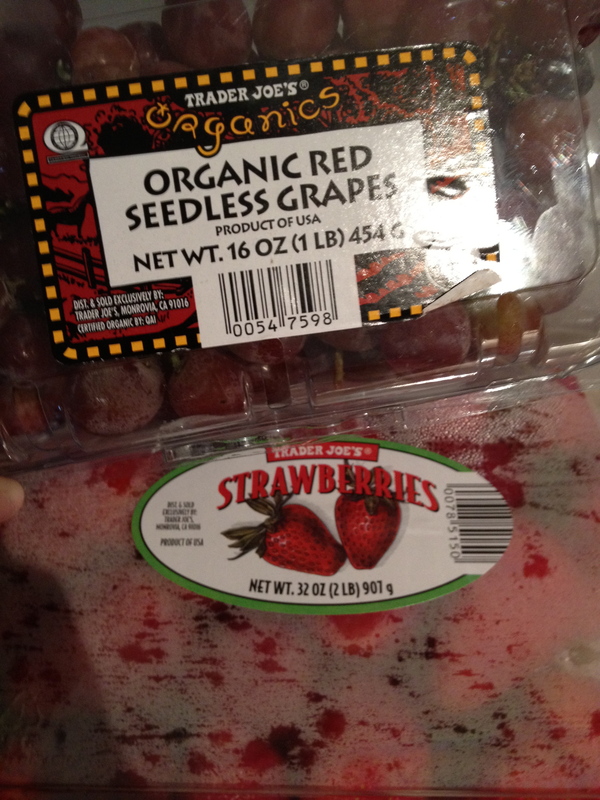 They have fantastic red grapes and strawberries. Other favorites…bananas, baby carrots, spinach, broccoli, blueberries, sliced apples, & oranges. If you can, I suggest buying organic produce. If NOTHING else. I mean, have you walked through a Wal-Mart produce section lately? Enough said. 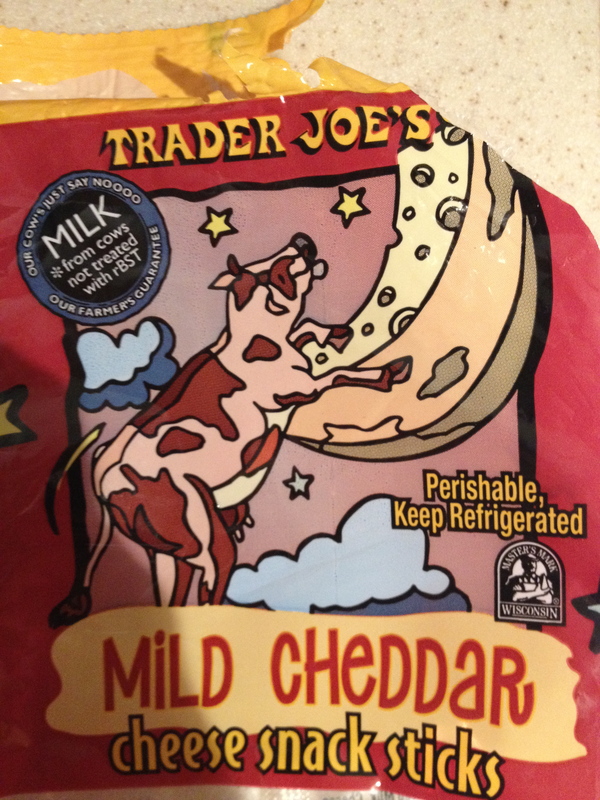 Another TJ favorite…mild cheddar cheese sticks. The BEST!! I even snack on them. 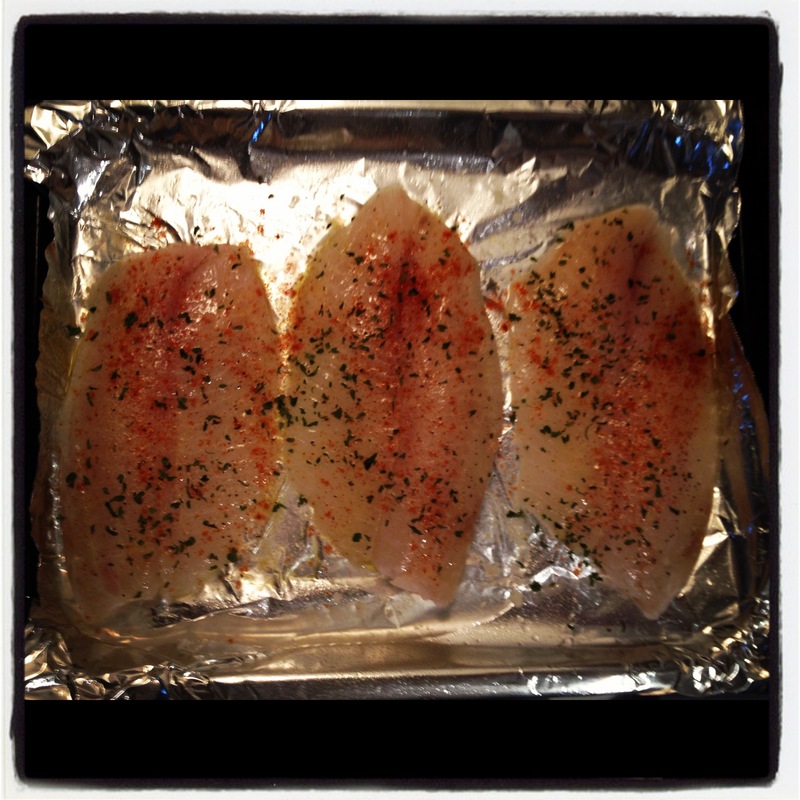 We both like these because they are a low calorie snack but have good protein. Plus they are organic. I am a HUGE fan of everything Cliff bar. Their Luna bars, granola bars, and kid snacks are the best! 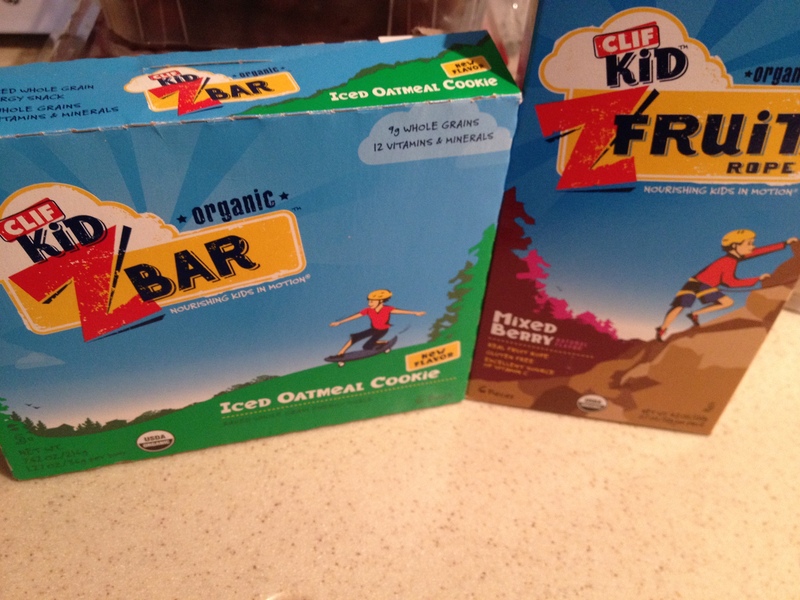 Cliff products are organic and these bars are baked. We both love the Iced Oatmeal Cookie. Sophie actually calls them cookies. You can’t go wrong with Cliff snacks! I was so excited when I ran across these. Organic whole grain oats & quinoa w/ blueberries. 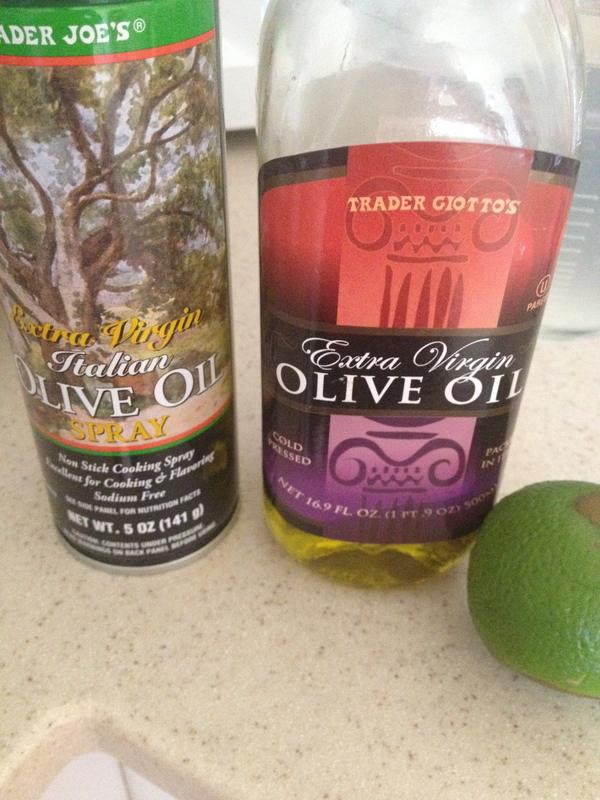 These are a great, quick breakfast. Target carries these. So, think applesauce in a pouch. 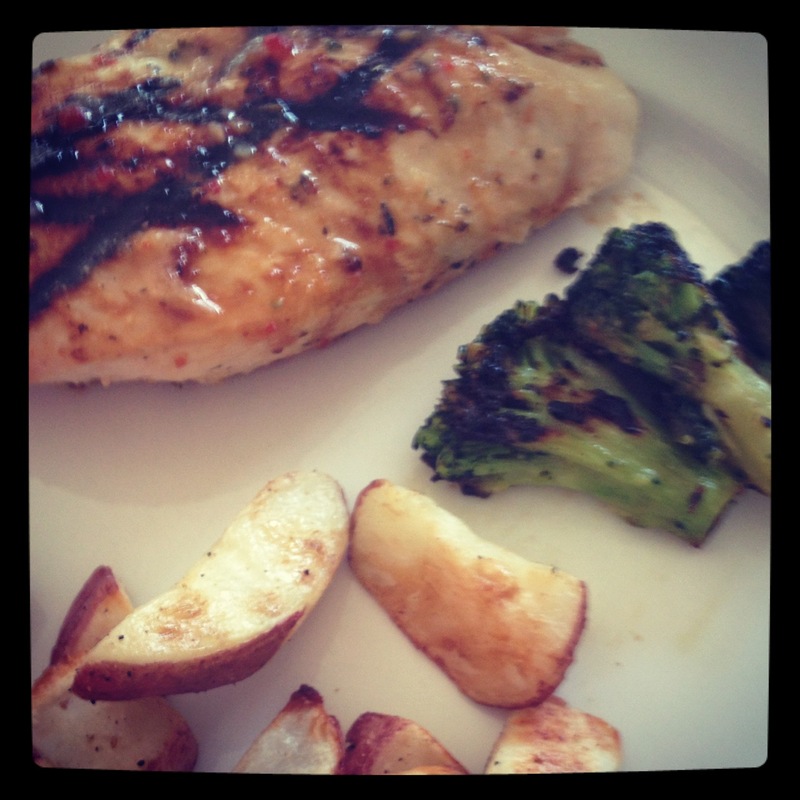 But with MUCH better varieties and even veggies thrown in the mix. This one is banana, beets, and blueberries. All organic, found at Target. 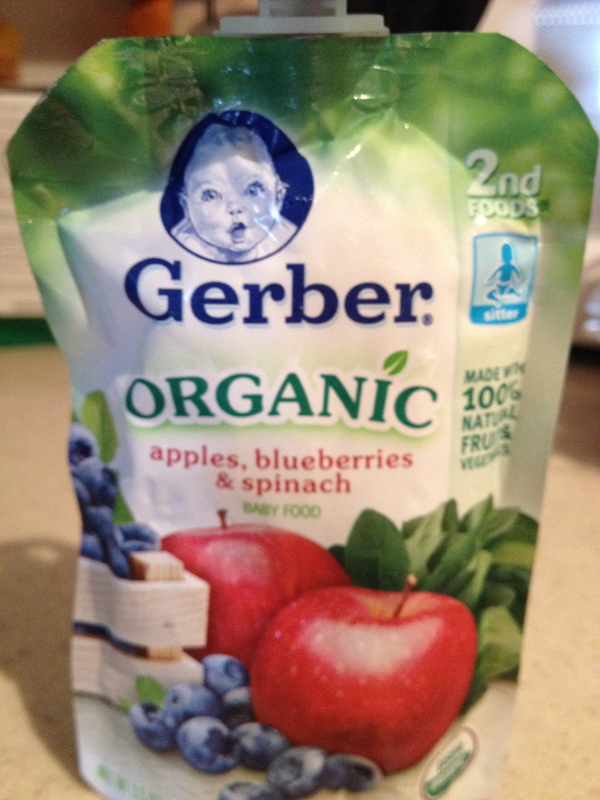 Even Gerber makes organic ones! I posted a few different brands, because these are the ones we like best. Gerber seems to have a better variety of fruits. Sophie loves all the combinations. I cherish all the races I’ve been a part of. I’ve learned something from each race I’ve run. 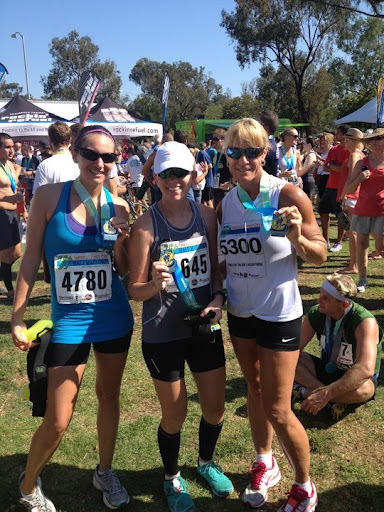 I proudly display all my medals, but what about the bibs? I’ve had them in a folder for a while but wanted a better way to store them. A few nights ago I scanned each race bib and saved them to my computer. 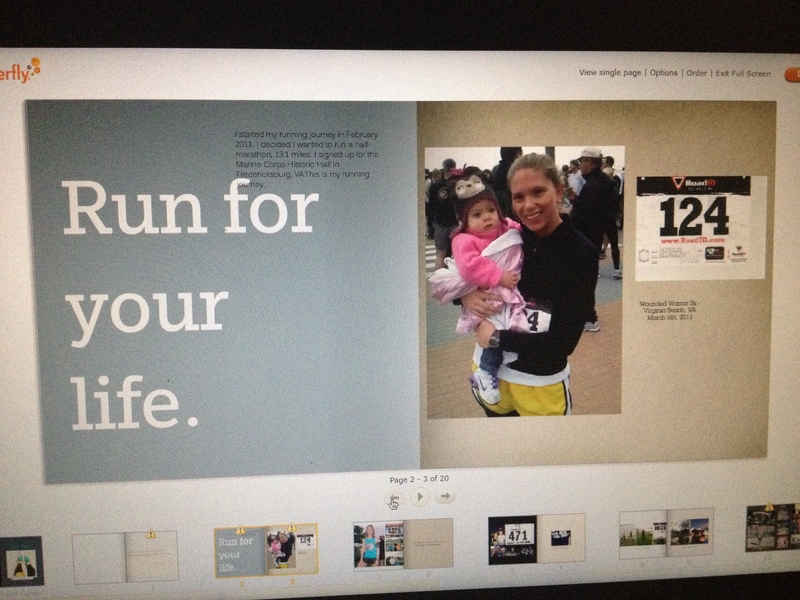 Being the Shutterfly freak that I am, I started a running memories scrapbook. I have a few more races to finish out my year, so I’m not quite ready to order it. 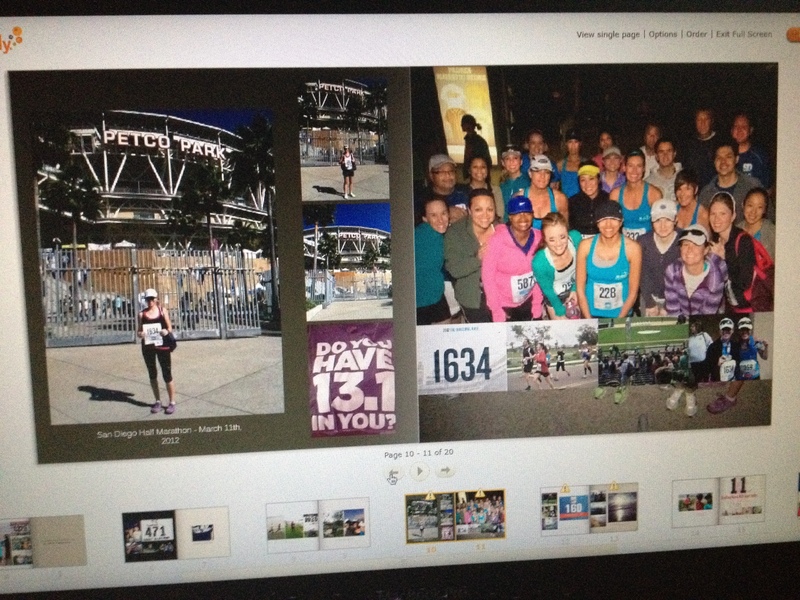 But now I have each bib documented in a scrapbook, along with the pictures from that race. I’m telling myself once it arrives I will toss all the loose bibs, but I still don’t know if I can. Either way, it’s still a great idea to have picture files of them. 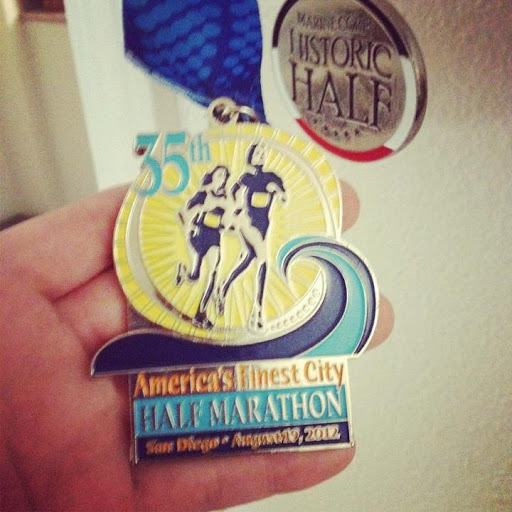 Ran my 4th half-marathon yesterday. 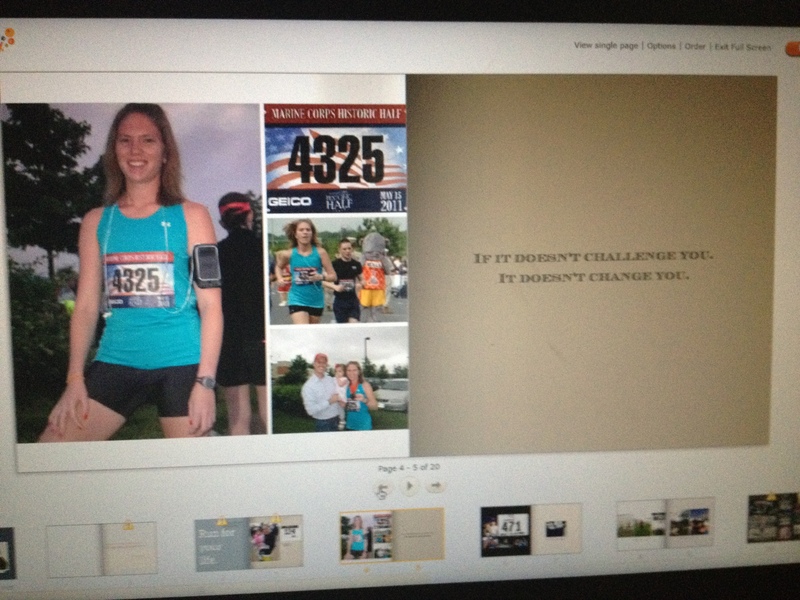 Although, looking back I would rather just forget that run/race happened. 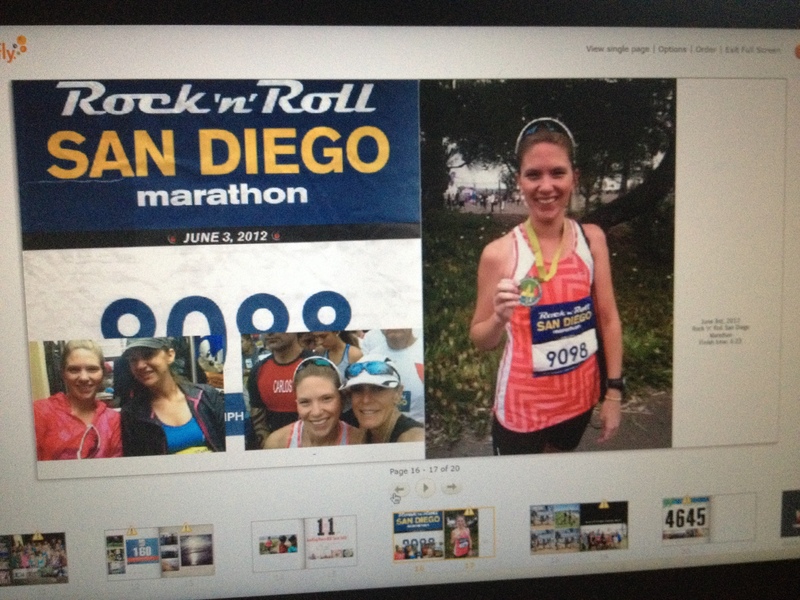 Terrible finish time, it was 80 degrees and the humidity level was 69% at the start line…what??????? 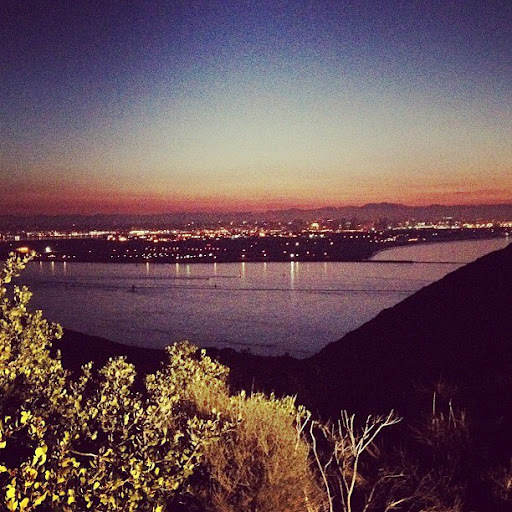 Start line view – how gorgeous, right? So thankful to have had Laurie or I might not have finished. I have never had to walk during a race, even my marathon, but I actually had to stop and walk through every aid station because it was that hot. No shade, just sun pounding down and sucking the energy from my legs. 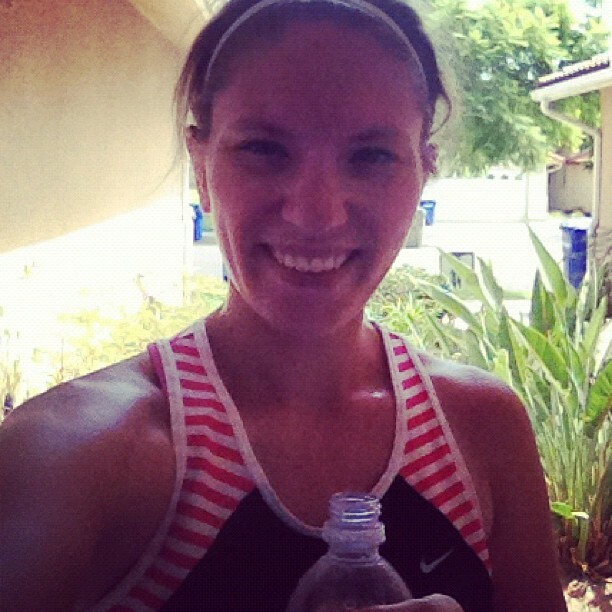 But honestly, it was run and felt awesome to finally finish, no matter my time. Now, on to the next adventure! !